Yesterday, luxury Swiss watch brand Hublot unveiled its latest Brand Ambassador internationally renowned supermodel Bar Refaeli. Bar Refaeli joins the ranks of celebrity Brand Ambassadors, including Kobe Bryant, Shawn "Jay Z" Carter, Dwyane Wade, Pelé, Usain Bolt and more, to star as the face of Hublot's ladies' campaign. Bar Refaeli is known throughout the world as one of the top supermodels of her time. Bar debuted in the 2007 Sports Illustrated Swimsuit Issue, and in 2009, Bar was featured as the cover model of the Sports Illustrated Swimsuit Issue. She has graced the covers of top magazines, including ELLE, Marie Claire, Harper's Bazaar, GQ and Glamour, and led campaigns for brands including Chanel, Moet &Chandon, Escada and more. 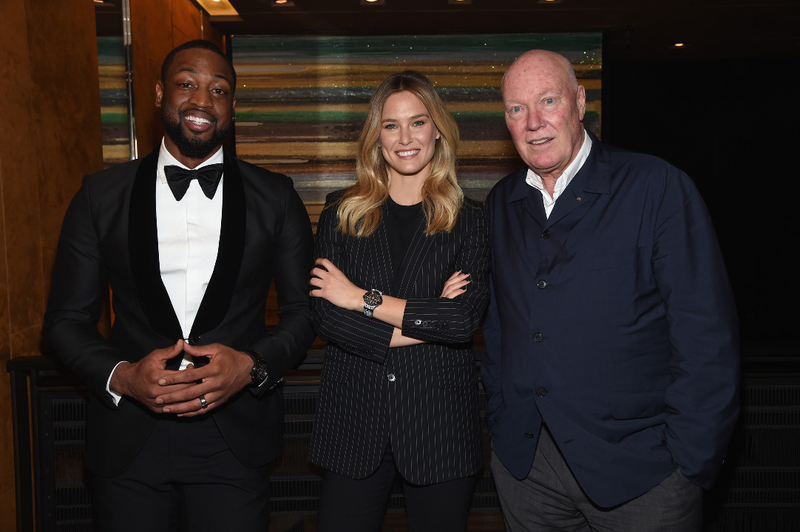 President of the LVMH Watch Division and Hublot Chairman, Jean-Claude Biver, and Hublot CEO, Ricardo Guadalupe, kicked off the partnership today in New York City the first day of New York Fashion Week by hosting an exclusive media event with Bar Refaeli. Fellow Brand AmbassadorDwyane Wade, who is in town for the 2015 NBA All Star Weekend, joined the celebration. Mr. Biver and Mr. Guadalupe unveiled Bar as the new face of the Hublot women's campaign, shot by famed photographer Chen Man, in a multifaceted production showcasing the brand's Art of Fusion concept, which honored the brand's Swiss heritage and craft along withits modernity. Bar Refaeli shared: "I'm extremely excited to be the first female face for the Hublot brand. I've been a huge fan for many years and am so proud to be a part of the family now." Jean-Claude Biver shared: "It is a thrill for our brand to be partnering with international supermodel Bar Refaeli. It is through this partnership that Hublot will take our ladies' 2015 campaign to the next level with a star who is renowned in all of our markets across the world." Ricardo Guadalupe shared: "In 2015, Hublot will dedicate ourselves to our ladies' collection, and our female customers will see a series of new timepieces that will embody the notion of the Art of Fusion, where innovation meets luxury and fashion. Bar is the perfect partner with whom we can convey this message on an international level." At the event, Bar strutted the catwalk in a couture gown, made exclusively from fabric by Hublot partner Bischoff, the leading Maison Suisse lace house, in a nod to the launch of Hublot's newest women's timepiece collection the Big Bang Broderie--done in collaboration with the storied firm. Hublot and Bischoff have come together to develop an exclusive lace pattern that creates a fusion with the Big Bang's iconic design a perfect fusion ready for pre-order on Valentine's Day. With a skull lace pattern on a dial studded with 11 diamonds and soft arabesques on the bezel and strap, the new ladies timepiece reflects a rebellious spirit coupled with the ancestral art of embroidery that is 100% Swiss made. Through this partnership, Hublot connects the past with the future, combining Swiss tradition with 21st-century creativity and technology. The event also served as a "groundbreaking" for the new Hublot NYC Flagship Boutique at 743 Fifth Avenue. The new boutique, at the center of New York's premier luxury shopping district, will be Hublot's largest retail location in the world.